There's not a thread of clothing you are wearing, a drop of coffee you are drinking or a piece of furniture you are sitting on that wasn't sold to someone. 1. Set the expectation. Before you clock-in or even walk in the door stop yourself and do an expectation check. What are you concentrating on? Will customers be hostile, mean, penny-pinching lookie-lous or will it be a fun day helping people buy from you? One of the old sales pros used to say, "Garbage in, garbage out" so watch what you listen to or watch before coming to work as it might trap you into a negative world-view. 2. Take care in how you look. Yes you can wear sneakers but no, you probably shouldn't. A sign at Piperlime's pop-up store in SOHO said it all, "It's time to give up lazy dressing altogether because its time to look fabulous again. Let's show each other and ourselves a little more respect. Let's put Saturday night effort into Sunday afternoon. 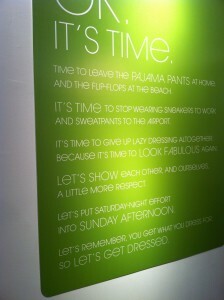 Let's remember you get what you dress for so let's get dressed." Excellent points! 3. Watch what you say. It is a fact we love to talk about people. From the craziest Internet stories to celebrity falls from grace, gossip is more popular than ever. The danger is that it comes from a place where we feel better about ourselves at someone else's expense. That's the opposite of selling. You should feel better about someone as a result of them coming in your shop. 4. Don't judge. I know, this is hard but you can't judge a book by its cover or a customer by their clothes. When we do that to try to decide who is worth our efforts, we're oftentimes wrong and settle for crumbs when we can have the whole banquet. 5. You're there to serve. Knights of the round table used to kneel as an act of servitude to their master or to royalty. It was an outward sign of servitude toward another. [Don't confuse this with slavery.] The act of serving another goes back to biblical times and is mentioned throughout literature as one of the greatest gifts to humanity. In retail right now, we often have employees acting as King or Queen, that they are doing the customer the favor. This is wrong. 6. Know your close ratio. Keep count one day of every customer you encounter and every customer you ring up. Divide the two to find your ratio of sales to visits. At first, this might be 1 out of every 10. With practice, you'll find by being aware of all the customers you had to sell, you've made more sales. 7. Sell something you hate. Find the ugliest thing in your store you can. This shouldn't be hard. Determine to find five things about it you love using the feature "it has" to link to the benefit for the customer "so you." What you'll find is that once you give up your assumptions and personal bias, you can find several things to make a compelling case why a customer should buy an item. 8. Stop selling the easy. Sure it's 30% off and has free financing for twenty years. But something like that will sell itself - you're not stretching yourself. 9. Be willing to risk the sale. Sometimes, things just aren't going well. 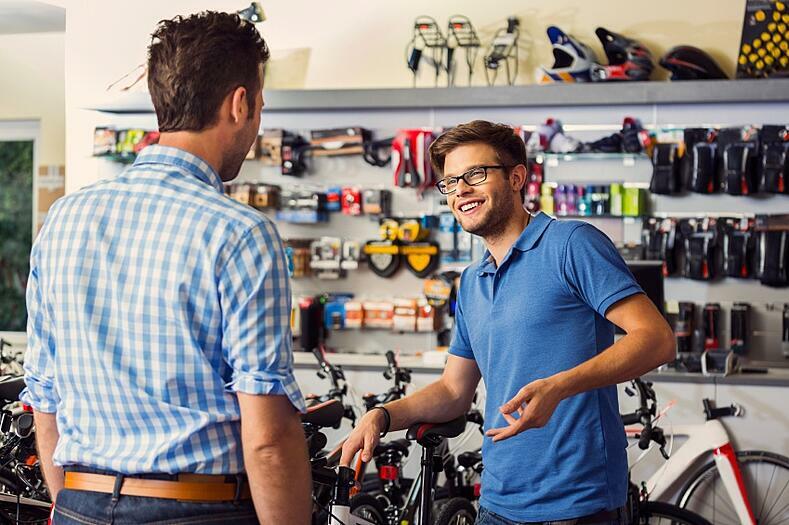 The customer is at odds with you and it just feels like you aren't on the same page. Ask, "Excuse me, but have I done something to offend you?" If you say it without malice or sarcasm most will apologize and give you a reason that has nothing to do with you. Without getting that out of the way though, you're just frustrating yourself and the customer. With addressing it head-on, you oftentimes make the bigger sale. 10. It's just a game. Making a sale is very fluid, sometimes you get lucky, sometimes you blow it and many times you make it happen. The goal is definitely to sell everyone but lighten up, millions of orphans won't miss a meal because a customer walked out on you. Be able to look at a sale afterwards and say, "I could have done this better." Take stock and then move on because you have another opportunity to shine walking in the door. It's easy to think a salesperson can just wing it when trying to sell something worth a couple of bucks, but the more expensive or luxurious your merchandise is, the more you absolutely have to have a selling system. A system that can engage a stranger, build rapport before giving the product features and benefits and drive to the customer buying from you that day - at full price. If you'd like help with that, please explore my site for the variety of ways I can be of service. Bob Phibbs, the Retail Doctor®, has helped hundreds of small and medium-sized businesses in every major category, including hospitality, manufacturing, service, and restaurant. He is a nationally recognized expert on business strategy, customer service, persuasion, and marketing. With over thirty years experience beginning in the trenches and extending to senior management positions, he has been a corporate officer, franchisor and entrepreneur.